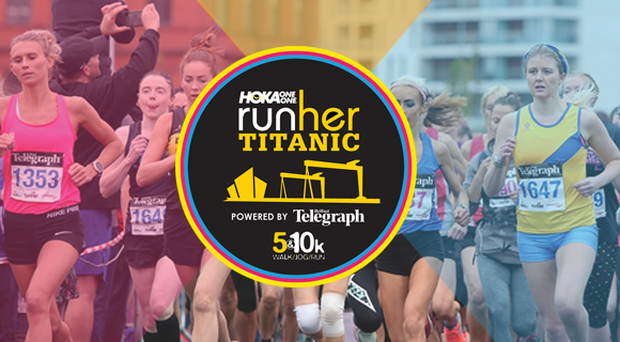 On 21st October 2018 women from all across the country will meet in Belfast’s Titanic Quarter for Runher Titanic 5k & 10k. And with our 8 week training programmes you could be joining them. Across the year Runher host fun, female-only running events suitable for all levels of fitness and experience. The goal is to get women together to enjoy walking, running or jogging together in some of Northern Ireland’s most iconic settings. With Runher Titanic 8 weeks away, their team of experts have devised two handy training guides. The 5k plan is designed to help those who have never run before to get off the sofa and get moving, whilst our 10k plan will help those who have already run a 5k race to power up for the 10k! So take up the challenge! Grab some girlfriends or go it alone – you won’t regret the adrenaline rush and the comradery of Runher! All women are welcome to enter, with the 5k open to those aged 11 or over and then 10k open to those who are aged 15 or over. You should be in good physical health and should check with your GP before taking up a new exercise regime. We have advised of daily pace and walk/run combinations to build up your fitness for the races. There is a day of “cross training” on each plan which is optional and doesn't have to be the same every week. It could be a 30 minute swim, pilates or yoga class or a cycle. Warming up and cooling down should be an important part of your training routine. From a technical point of view, a warm up is a way of increasing your heart rate and circulation around the body prior to exercise. Taking the body through dynamic motions warms up muscles that are usually inactive when resting, such as the glutes or calf muscles, so that when the gun goes off your body is as ready to race as you are! There are a number of very popular dynamic actions carried out by runners of all abilities, such as ‘high knees’, ‘heel kicks’ and even star jumps to get things moving pre-race, and videos of these actions among many more can easily be found online. It may seem obvious but walking and jogging slowly for a couple of minutes is a good way to start any run. Before each run you should walk briskly for 5 minutes and the first part of the run should be at a slower pace. Throughout your training you will alternate walking and running in order to progress your fitness. In our 5k programme you will be running at an “easy” pace. It should feel very relaxed and that you can go at that pace for miles and miles. Being able to have a conversation without being very out of breath is a great rule of thumb for this kind of running! Remember, our goal is all about the finish line, not the finish time. In our 10k programme you will also need to run at a “steady” pace. ‘Steady’ is a moderate pace; faster than “easy” but not running at 100% of your capacity. This is the kind of pace that it would require increasing effort to keep up for a very long time. Cooling down is carried out post exercise and is a way of transitioning your body to a resting state after intense exercise. It can take the form of a slow jog for 5-20mins, allowing the heart rate to lower gradually. In some cases it can reduce symptoms of dizziness after a very hard effort, and from a long term point of view, ‘cooling down’ or ‘warming down’ effectively encourages faster recovery, so you’ll feel much better on your next run! Fuel your body for running with a well-balanced diet. This is a time when you need to be cautious of what you eat. Foods with too many complex constituents or that are particularly heavy are best avoided as they can cause stomach problems during your race. Simple carbs are always a safe option to fuel up, such as porridge, granola, pancakes or flapjacks! Energy gels and other supplements are also a very popular option which can be taken before and during exercise. They are very easy to take, and come in different forms - gels, bars, jelly beans, or even dissolving tablets for your water, whichever form you prefer! It is essential to refuel with the correct food so that the body can recover and prepare itself for your next effort a soon as possible. Eating correctly will also help your body carry out all the muscle repairs and allow the adaptations to take place that make you a faster runner. The faster you can refuel after exercise the better. Choose something high in protein and nutritious right after your run, such as a protein bar or a fruit smoothie, and then have a good meal afterwards! So what are you waiting for? Grab your trainers and get running!